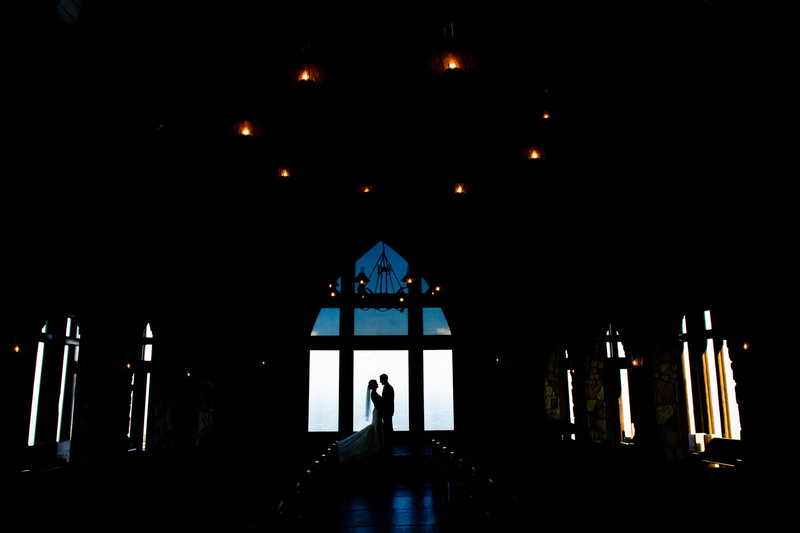 A bride and groom share an intimate gaze in the silhouette of the windows of their venue, The Cliffs at Glassy Chapel. The Cliffs at Glassy Chapel is an amazing venue that takes your breath away. This Glassy Chapel is placed at the top of Glassy Mountain and looks over valleys, farms and Greenville city. It holds around 200 people and your able to use one of the Cliffs reception area for after your ceremony. This awesome bride and groom decided to take pictures after their wedding ceremony was over to have the whole chapel to work with and so people wont be walking in during pictures. We walked around the chapel and caught some great pictures with the mountains in the background which are amazing but something that is so special about the Cliffs Chapel is that it is made of mostly glass so your can see the mountains with in the chapel as well. The windows with in the chapel give an amazing back drop with the view but also the construction of the windows really gives a great frame around the bride and groom. Having them here as a silhouette gives everything around them not as important as them, you see first the bride and groom and windows not the detail with in the chapel that could take away from them. This is so romantic between the bride and groom looking towards each other and snuggling in.